"Thus, my conclusion on Texas Central Railway is about the same as on All Aboard Florida. Both are private sector projects, to be done via project finance that must be paid back from the project's own revenues. There is little or no risk to taxpayers, federal or state, in either project." Houston ranks #3 on America's Cities of the Future behind NYC and SF. ULI makes the economic case for increased walkability in Houston. While I do support overall efforts to increase walkability, I suspect they have their cause-and-effect a little muddled here when they claim walkability adds so much value. Walkability is a proxy for density which is a proxy for an in-demand neighborhood, so of course rents are higher, but walkability isn't necessarily the primary driver (although I'm sure it helps). That doesn't mean a developer can move a strip center up against the sidewalk and put apartments on top of it in the far suburbs along 1960 and instantly add value to it - in fact he might kill the retail with the inconvenient parking. Same reason suburban developers don't build large subdivisions of tightly packed mixed-use and townhomes up against the sidewalk. A comparable analogy would be noting that cars with a top speed over 150mph (i.e. luxury and sports cars) can charge, on average, much higher prices, so all cars should be designed to go that fast - the logic doesn't quite hold. "In Texas’s cities, by contrast, progressives often share, to some degree, the state’s pro-freedom, pro-market ethos. That’s why Houston, though hardly without restrictions on building, has no zoning per se and a pro-market Democrat, Annise Parker, for mayor. Unsurprisingly, it remains an affordable place to live, as do other low-regulation cities, such as Indianapolis. At least some on the left appreciate the principle of liberty when it comes to things like free speech: they understand that odious opinions have to be tolerated, or everyone’s liberty is at risk; and that selective free expression isn’t really free. But they fail to see that selective economic freedom brings its own injustices and inequities. Progressives should embrace a broader principle of economic liberty for American cities—not only for the sake of their own pet causes but also because it’s the right thing to do." Some neat before-and-after pics of big developments in Houston. A Chicago business story on United vs. the City over O'Hare expansion extensively discusses United's IAH expansion plans even after the addition of international service to Hobby for Southwest, despite threats from UA to the contrary. Hat tip to Aaron and Joel. "Forty-four of North America's largest airports have "international" in their title. Only one has the word "intercontinental." No word yet on whether Houston's proposed space port will be named "intergalactic." Fifteen of the world's 20 busiest airlines serve Houston. They are Delta Air (1), United (2), Emirates (3), American (4), Southwest (5), Lufthansa (6), Air France (7), British Airways (8), Air China (12) Singapore Airlines (14), Turkish Airlines (16), Air Canada (17), KLM (18), and Qatar Airways (19). When Air New Zealand starts service later this year, IAH will be the only airport in North America that serves all six inhabited continents. There are only four other airports in the world that can claim the same--Dubai, Doha, Abu Dhabi, and Johannesburg. When the Houston's Hobby International Terminal opens this fall, Houston will be one of only six markets with dual international hubs"
And while we're on the topic of our image/brand, I'll put in another plug for Houspitality. I get very positive feedback from everyone I've pitched it to. This also might be a good time to mention a dissertation by Josh Dinsman on branding cities, including an in-depth case study of Houston (he interviewed me as part of his research). I've been siting on this one for a while waiting until I had time to do a thorough discussion of it, but since that doesn't seem to be happening anytime soon, I want to get it out there for those who might be interested and then hopefully I'll circle back to it for a more in-depth post at some point in the not-to-distant future. The next big topic is the new I45N expansion plan I discussed last week. Oscar Slotboom of "Houston Freeways" fame has done an extremely in-depth and thorough analysis of the flaws in the plan, including suggested corrections. I was planning to try to summarize and highlight parts of it here, but I can't do it justice, especially with his impressive graphics - you'll just need to skim the whole thing. While we both still support the overall plan, we also agree it can be made much better. In fact, after reading his analysis and seeing some of the big flaws in the plan, I'm concerned the complexity of this project is stretching TXDoT's design and analysis capabilities vs. their simpler normal freeway widenings. There are just so many complex connections around downtown (45, 10, 59, 288, Hardy, managed lanes, entrances and exits) that it's hard for one human mind to keep it all straight. Thankfully Oscar has an exceptional mind for this kind of detail, and hopefully TXDoT will take his analysis very seriously and make the project even better. If you'd like to comment on his analysis, or just participate in the discussion/debate, HAIF has an active discussion thread on it here. Before getting into this week's post, just a heads up in case you missed it: my Good/Bady/Ugly MetroRail post from a couple weeks ago got refined into a Sunday feature op-ed in the Chronicle today. They even used a few of my pictures, which was cool. Most of the feedback on it has been quite positive. My primary feedback to TXDoT at the information session involves the new westside downtown connector, which is far too downtown-centric in my opinion (see pic below). 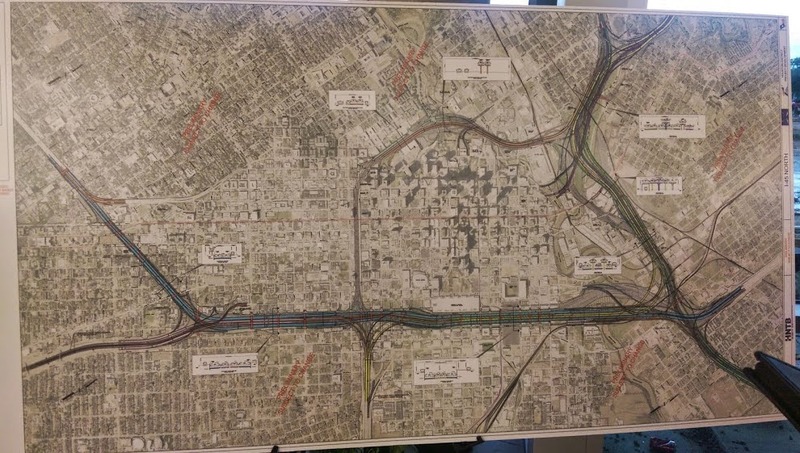 It ignores the vast and growing populations of densifying Midtown, Montrose, and Washington Ave that need access to these freeways with connectors from Bagby/Brazos, Allen Parkway, and Memorial, respectively. Not directly connecting Allen Parkway is an especially large oversight, IMHO. Improving these connections will also reduce the load on I10W inside the loop, which is where many of these people drive for freeway access today. I'd even be in favor of keeping the existing westside ramps/connectors as they are currently configured for simplicity and saving money (even without a Memorial connection). My next big set of feedback involves the new I45 managed lanes, which simply dump downtown instead of connecting through. Most of my readers know I've been a longtime advocate of having a comprehensive managed lane network across the city that would enable express commuter bus services from any neighborhood to any job center. That would include communities on the northside that need express commute services to the Medical Center, UH, Greenway Plaza, or other major destinations and job centers on the southside, and vice versa. If the lanes terminate downtown, then that's not possible. TXDoT needs to adopt this comprehensive managed lane network philosophy now (as opposed to downtown-centric), so that these lanes all connect together over the coming decades of construction. I45 needs three sustained lanes both directions all the way through downtown, not two. The new I10 express lanes on the north side of downtown crunch down from two lanes to one on the west end near Houston Ave, which seems like a bad bottleneck in the making. Another future bottlenecks is 45 northbound where it drops from six lanes to four at the North Main exit. At least five of those lanes need to continue through - crunch down shoulders if necessary in the very tight right-of-way. 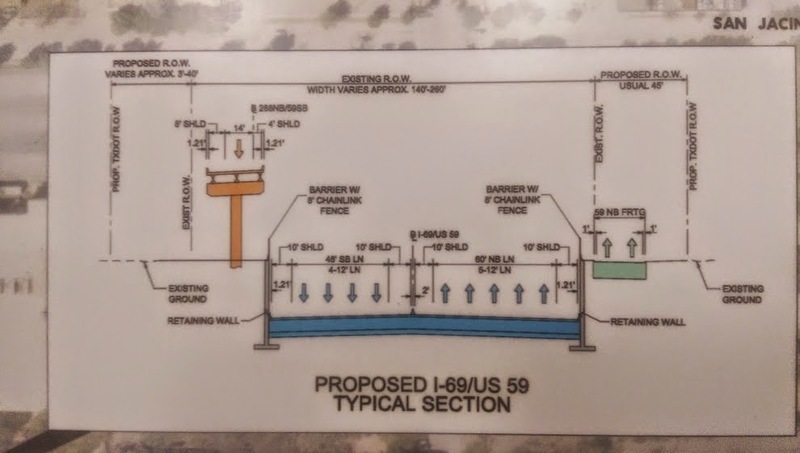 Runnels in the East End needs to continue to connect directly to the feeder and the freeway entrance ramps. Navigation (which connects to Runnels) is a growing destination street. Immediately after TXDoT announced this plan, two separate but similar visions came forward for converting the closed Pierce Elevated into a park similar to the extremely popular High Line in NYC. My friend Oscar Slotboom of "Houston Freeways" book fame makes this Pierce Elevated Park proposal, and another group has made this proposal for Pierce Sky Park. 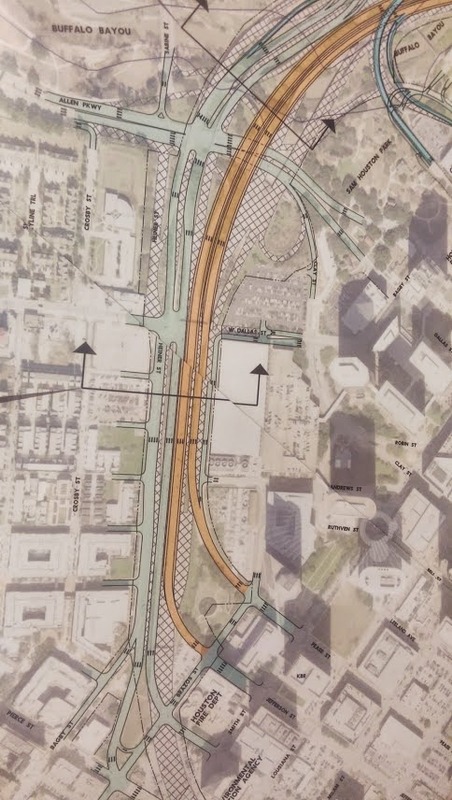 As beautiful as the renderings at Pierce Sky Park are, they're a little misleading since they assume the complete closure on both the west and south sides of downtown, when TXDoT plans to keep connector ramps to the west side, including over the bayou. It's likely only the south Pierce would be available for park development. Lisa Gray gave both proposals a great writeup in the Chronicle, and they also received editorial board support. I think it would be an amazing city amenity - and hope TXDoT will take them seriously and the downtown folks will keep an open mind, no matter how much they've wanted to bring down the Pierce Elevated for so long as a barrier between Downtown and Midtown. The barrier is less the structure itself than the constant pounding of cars and trucks - converted into a quiet park along with some enhancements underneath would remove the barrier psychology. Based on the NYC High Line, a park conversion instead of demolition could pay for itself many times over with increased land values their associated property taxes. In fact, it could actually cost less than demolition! "The High Line in New York City generated $500 million in tax revenue from a $150 million investment, according to John Cryer, a spokesman for Pierce Skypark." My suggestion would be for the Midtown Management District to officially take over as the champion of this Pierce park proposal, given that they both benefit the most and can organizationally sustain the vision and the energy over the many years it would take (the earliest it might actually happen would be the early to mid 2020s after construction is complete and the Pierce is closed). If you'd like to learn more about the project yourself, here's the official TXDoT page along with this slide presentation which includes detailed renderings (KUHF version with slide notes). They're taking public feedback until May 31st. UPDATE: Dug's update at the Chronicle. UPDATE: A TXDoT visualization video of the project.